In the 21st century, television is much more than an entertainment device. For anyone out there who wishes to learn spoken Hindi, watching a Hindi TV show is a brilliant way to do that. Regular exposure to quality Hindi TV shows will help make you fluent in the commonly used words in the Hindi language, the tone, and the culture of India as well. Netflix and YouTube make available several Hindi shows that you can check out and choose from. The easy recaps, optional playback speeds, and free access to Hindi TV shows online make it a great resource for beginners. Hindi TV shows in YouTube really offer so much convenience! 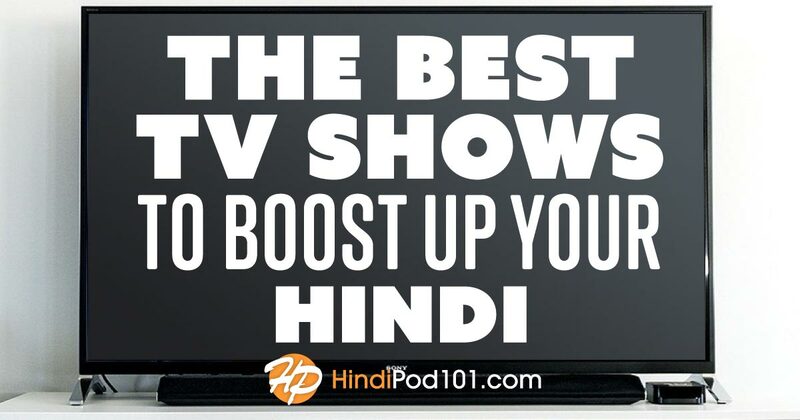 But before setting out for your favorite Hindi show, brush up your basics at HindiPod101. 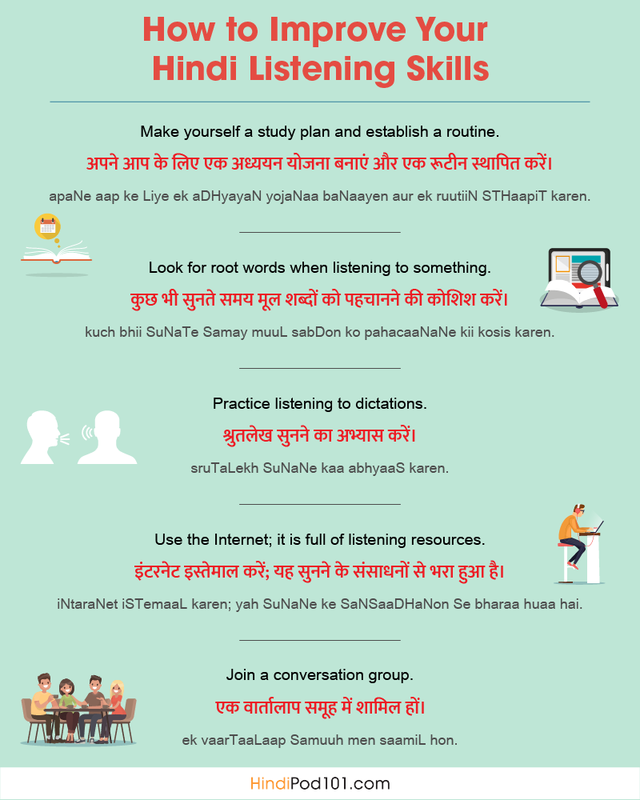 Get one step ahead with your learning by following these Top 10 Strategies while you sit back and watch Hindi shows online. If language learning is an ocean, then get ready for a deep dive with unlimited free Hindi TV shows online. Having said that, selecting the right serials can be a tricky business! But you need not worry about that. We’ve handpicked the real pearls, the top ten Hindi TV shows, exclusively for you. So, let’s embark on the voyage of Hindi learning with these ten must-watch Hindi shows of 2018. But Why these TV Shows? 1. Why these TV Shows? Wondering how we came up with “the list” in the first place? Well, here are our grounds for recommending these most popular Hindi TV shows to you. The A-listed popular Hindi TV shows mentioned below give you the low-down on the Hindi words spoken in daily life. Simple language and commonly used Hindi phrases make these programs worth watching for any Hindi learner. For a starter, catching up with the conversations in an ordinary show in Hindi language can be exhausting! But these top-class serials not only have pristine dialogue delivery, but also attempt to use simple words spoken at a desirable speed. Whether you want to watch a Hindi comedy show or a spicy drama, our list has it all. In the end, what matters most is a compelling story that grabs your attention and keeps you glued to your TV set. Stellar performances and exquisite direction are more than enough reasons to watch Hindi TV shows online. While the genre for these best Indian Hindi TV shows may be different, the artistic finesse is visible in all of them. Giggle with this refreshing Hindi comedy shows list. Curious souls must also explore some interesting facts about India on HindiPod101. Learning has never been such fun before! Zabaan Sambhalke surpasses all the other comedy Hindi shows. Inspired by the famous British sitcom Mind Your Language, it’s our first recommendation. This is mostly because any Hindi beginner can totally relate with the characters in this program. When Mohan Bharti (the teacher) tries to teach Hindi to his adult students, it turns into a rather rib-tickling series of events. The whole setup of this Hindi comedy show revolves around a classroom, where students are struggling with wrong pronunciations, misspellings, and incorrect word usage. A brilliant star cast, including Pankaj Kapoor and Tom Alter, is there to shake you with laughter. Originally, the serial aired during 1993-1998. However, you can still catch up with the first episode on its YouTube Hindi TV show channel. If you want to know the real maneuvers of typical India, watch Office Office, one of the best Hindi comedy shows. For a long time, bribery and corruption have crippled the system of Indian society. Office Office hits just the right chord on these topics with its wit and humor. The whole series comprises of more than 100 episodes, each one with a unique story. The cast includes big names including Pankaj Kapoor, Asawari Joshi, and Sanjay Mishra, all exceptional theatre artists. Mussaddi Lal is the main character, who represents every Indian. He goes to different government offices and seeks help for one problem or another. But every time, he’s fooled and robbed by the officials (in a hilarious way, of course). Curious? See for yourself how this usually goes down! Go ahead and download this Hindi show to get a feel for the story. Welcome to the world of classic shows in Hindi. For you, we recommend these must-watch Hindi shows online for free, which have ruled our childhood for so many years. You can also easily download Hindi shows of your choice from YouTube. 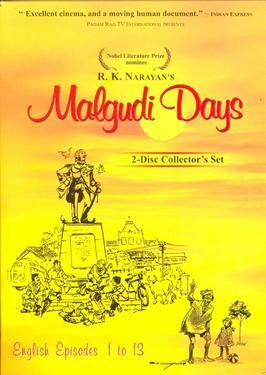 Malgudi Days is based on the classic novel written by imminent story writer, R. K. Narayan. The series showcases the simple lifestyle of South India. When you get to know the little boy Swami and his neighborhood, their innocence will touch your heart. Each episode is about 20 to 25 minutes long, and the short stories emphasize basic moral values with gentle humor that always has an interesting twist. Watch this Hindi show online from the beginning. Most of the 90s classics were always better than the new Hindi TV shows. Byomkesh Bakshi is one such gemstone. With its gripping storyline, this fictional detective series grows on you. The fragrance of the typical Bengali culture turns the program into an unforgettable experience. Frankly, watching free online Hindi TV shows like these is the most gratifying way to improve your Hindi language skills. While talking about Hindi serial/TV shows, it wouldn’t be fair to skip the animation genre. Here are the best kids’ programs that even adults can connect with. After all, who doesn’t love Rudyard Kipling! Try the Hindi-dubbed Shōnen Mowgli version of Mowgli and you’ll fall in love with it. 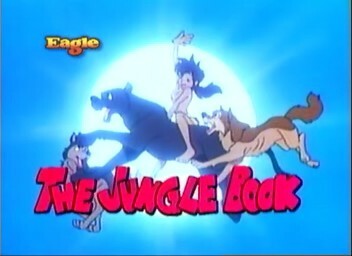 Just like other Hindi TV shows, online free episodes are available for Mowgli also. Enjoy the melodious title song before delving into the heart-touching bond between a human baby and the jungle animals. The values and ethics portrayed in the show look familiar and are quite inspiring. Go online to watch this Hindi TV show. Check out the download site for this great show. It may not exactly be an animation, but the puppet show Potli Baba Ki by Gulzar easily falls under the category of best Hindi shows/serials for beginners. The dialect used is basically a mixture of Hindi and Urdu. Similar to other Indian TV shows, Potli Baba Ki promises high entertainment value. You’ll get to explore simple moral lessons with a cuteness overload. With TV shows, Hindi learning becomes so enthralling. What’s more! For most of the Hindi TV shows free download is also available on many sites. Astitva…Ek Prem Kahani is a brilliant Zee TV Hindi show that was way ahead of its time. A successful doctor named Simran falls in love with a guy, Abhimanyu, who’s much younger than her. They share a passionate love bond and get married amidst all the objections and disapproval of the society. Later, Abhimanyu develops an extramarital affair with another girl, which devastates Simran. In the league of various new Hindi shows, Astitva is like a breath of fresh air due to its realistic plot and storyline. To catch a glimpse of this Hindi TV show, a free download video is available. Shanti is a journalist who meets two high-profile filmmakers, who are also close friends. As she begins to document their success, darker secrets of these men are revealed with time. But the initial mystery is just the tip of the iceberg. Both of these filmmakers have a gloomy past that they’d successfully buried in their hearts. But life finally brings them face-to-face with their deeds. A story woven with perfect twists! If you’re looking for pure news programs, there are plenty of suggestions. And yet, DD News is what we recommend. It’s the best Hindi TV show/news program for staying updated with the most important current events. 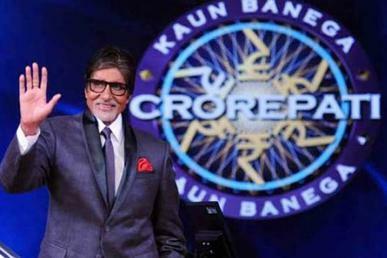 Inspired by the British program Who Wants to Be a Millionaire?, KBC (Kaun Banega Crorepati) is a Hindi reality show. The final contestant is chosen on the basis of a rapid fire round. Four lifelines are there to help contestants take on all sixteen questions. Not only is this show highly entertaining, but the program’s script is also so flawless and pristine that even a beginner can learn a lot from it. Learn more about this Hindi TV show and download HD episodes. An easy way to improve your language is to watch Hindi TV shows online free full episodes and learn. We’ve been telling you about all the top-notch free Hindi shows and here comes another one. Surabhi is not any typical show. You can learn from this TV show news both Hindi and the cultural diversity of India. The anchors of the program receive various letters from across India and they read them out to the audience. They then answer questions asked by the viewers and respond to their feedback. If you’re interested, catch a glimpse of its first episode. With the great quality of online TV shows, free Hindi learning becomes possible for many people. For most of the online Hindi TV shows, free episodes are generally available on YouTube. Here are a few brilliant shows that are highly popular in India but haven’t grabbed a place on our list for a few reasons. Indians are crazy about their mythologies and historical shows. These online Hindi TV shows include Mahabharata, Ramayan, Chandrakanta, and Jodha Akbar. The type of Hindi used in these programs is quite ancient and most of the words are heavily inspired by the Sanskrit language. That’s why, while these stories may feel enchanting, the dialect is too difficult to catch up with for non-Hindi people. Still, if you want to watch these Hindi TV shows, download MP4 videos from any popular website. Honestly, Hindi television is flooded with a new show every day, but most of them have stale scripts. They are repetitive and lack quality. The overdramatic elements stuffed in these series make them worse. Even in terms of language, there’s not much material for Hindi learners. We’ve shared as much as we could about the best Hindi TV shows, and we hope that we’ve shown you the benefit of watching Indian TV shows to learn English. So scroll through our list again and start watching Hindi TV shows episodes! Keep in mind that Hindi online free learning is now made easy by HindiPod101. While you’re gorging on these programs, HindiPod101 will help you catch common words and phrases quickly. You can also look up new words on our website and practice in a better way! 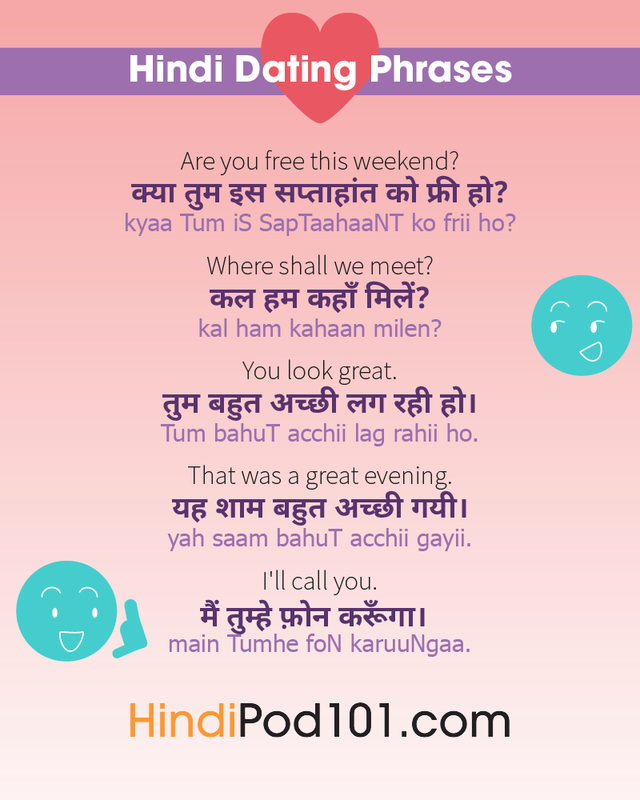 So, join us and have an amazing Hindi time with us on HindiPod101! Planning to stay in India and want to know how to find work in India? If you know how to talk in Hindi, you’re already halfway there! In a country divided into so many states, their native languages and cultures could prove tricky when you’re looking for jobs in India. With a little effort, you can find promising opportunities if you Google India jobs. Whether you wish to grab government jobs in India or plan to explore IT jobs in India, command over Hindi interaction keeps you ahead of others on many fronts, since your job is just one aspect of your life. Knowledge of Hindi will help you blend with your colleagues without missing out on the jokes! So, if you’re new here but know the basics of Hindi, you’re good to go. However, presuming that you have zero understanding of this language, HindiPod101.com can turn you into a proficient Hindi learner with these amazing strategies. Simply visit our My Teacher page and check out all the know-how of our versatile and easy teaching process. Meanwhile, let’s explore the best cities in India, which are blooming with loads of career opportunities. As India is a vast country, a high economic and social disparity ratio comes as a part and parcel. With significant industrial expansion and global networking, India is on the verge of becoming a developed country. These are the urban areas that offer the highest-paying jobs in India. Bengaluru (the Silicon Valley of India) is the pioneer of the Indian IT sector. The capital of Karnataka, Bengaluru is everyone’s favorite city for numerous reasons. As long as you wish to find a job in India, Bengaluru should be your first choice. The town welcomes you with its safe and open culture. When compared to the other major cities, Bengaluru has the maximum growth rate and is mostly known for its impressive tech parks. Being the capital of India, Delhi needs no introduction. The city offers the best airports and restaurants, and carries a vibrant metropolitan culture. It’s also one of the hottest hubs for job opportunities. For instance, Google/Amazon jobs India and Delhi will almost always show up among the highest-paying positions in India. For job seekers who wish to find a new job in India but would prefer a quieter and greener location, the serene city of Pune is your answer. Pune stands as the second-biggest city in the state of Maharashtra. The living standards are affordable and the weather remains pleasant most of the year. In case you hold an impressive experience in the IT or education sector, there are plenty of jobs for you. All the big IT companies, like Microsoft, Google, and Facebook, have their offices in the royal city of Hyderabad. Given that you already know how to find IT jobs in India, this town is nothing less than a heaven. From the mouth-watering popular Indian foods to rich cultural heritage, impressive growth rate, and great salary packages, Hyderabad is a bliss for job searchers. Gurgaon is the industrial nerve center of India. Its close location to Delhi makes it even more popular amongst the freshers. The top sites for jobs in India quite often present jobs located in Gurgaon. Maruti Suzuki, General Electric, Coca-Cola, Pepsi, BMW, you name the brand and its headquarter is there in the city. With additional effort, this town can even offer you some of the best online jobs in India. The Capital of Maharashtra, Mumbai is the nucleus of bank jobs in India as well as government jobs in India. The largest financial banks such as RBI, SBI, and financial organizations like LIC, SEBI, NSE, and BSE are all present here. It also has immense scope in blue collar jobs, IT, healthcare, and engineering. However, the standard of living is quite high in Mumbai and local trains are the preferred mode of conveyance. Living in the industrial city Ahmedabad would be significantly easier on your pocket as the house rents are low. The city is well-known for its textile industries and many FMCG Indian brands have offices here. Further, TCS has expanded job opportunities in the IT sector. Assuming that you can deal with the hot and humid climate of the south Indian city Chennai, the metropolitan area won’t disappoint you careerwise. Surrounded by the Bay of Bengal, it’s one of the safest cities in India. Chennai shelters the grandest automobile industry players. It’s also famous for health tourism and the Tamil film industry. Before we delve into the question of how to find a job in India, let’s explore which jobs are the most handsomely paying in the country. This will help you get a better grasp of the job market in India. This is one of the most reputed and high-paying jobs. A CA career is for anyone interested in the maintenance of balance sheets, financial reports, and documents while reviewing potential financial risks. Get more details on the Official CA website. The CAs get a package anywhere between INR 10-25 lakhs, depending on their experience. If you have qualified on the final CA exam in one attempt, chances are you will find a job in Indian cities with an excellent salary package. Why not check out some job postings? Every company needs a management professional. It’s one of the most versatile jobs that requires Indian companies to look for global talents. Being an MBA from abroad makes you more favorable for this position. Freshers from reputed colleges often get paid handsomely. As you cross this painstaking level and go up, the salary package becomes even more lucrative, ranging between INR 5 lakhs to INR 1.5 crores. This position involves making contingency plans for the company and excelling in logical and mathematical skills. A business analyst job description in India requires you to show up with a relevant MBA degree in the related specialization. If you have that, you’ll be sure to get a salary between INR 3 lakhs to INR 2 crores. An investment banker loves playing with numbers and can give sound advice regarding money matters. Every organization and company needs an investment banker. No wonder it also qualifies as one of the top ten government jobs in India. A degree in accounting/finances/math is a must for this position. The minimum and maximum package for an investment banker are INR 6 lakhs to INR 35 lakhs or above. There are lots of responsibilities for a software engineer. From designing an app to its development, testing, and maintenance. You can start the career once you get a bachelor degree in IT or computer science. The annual salary starts at INR 2 lakhs and reaches up to INR 1 crore. While government jobs in India require an Indian citizenship, more flexible policies are being formed when it comes to non-Indians. Keeping that issue aside, one really needs guidance on how to find government jobs in India. Most of the public sector jobs are ideally posted on some of the most reputed websites in India. Some of the best government jobs include those in the oil and natural gas sector, all agriculture jobs in India, jobs in wildlife in India, jobs in environmental science in India, or in medical fields such as neuroscience jobs in India. The package is quite generous for higher posts and lots of securities and other perks are provided to the government officials. Before moving on to the next section, here are the ten most difficult Hindi words we thought you’d like to practice with us! And with HindiPod101.com by your side, you may start with learning how to say “find a job” in the Indian language. As a foreigner, thinking to yourself, “I will find a job in an Indian metropolitan,” isn’t enough. Maybe you know how to find a job in India, but there are limited career options that you can pull off easily since you don’t speak Hindi or any other local language. Let’s glance through some of your best options on how to get jobs in India as a foreigner, one by one. To begin with, you get to travel a lot and it pays huge. Isn’t that great? You visit all kinds of places around the world, not stuck in one country. Here’s everything you need to know about what a commercial pilot job is like! Being good at English adds to your communication skills for this job. However, with us, you can also master the Hindi language and learn how to get this fun job in India. “I need to find a job in an Indian city but don’t know which one!” Does this sound like you? Well, here’s a tip. Why not start by applying as a spoken English teacher or teach other foreign languages that you know? In India, these kinds of jobs pay well and you also get some time to learn the local dialect. You should either take a course and pass the language teaching exam or follow these steps. This is a booming sector with an infinite number of possibilities. Whether you have the qualifications of a surgeon or general physician, the lavish annual packages start at around INR 9 lakhs and there’s no upper limit to how much you can earn! Want to work abroad but don’t know how to find IT jobs in Dubai from India? The web is full of answers to your questions! Did you find a job in India but weren’t satisfied with it? No problem. Our part-time job suggestions can keep you on the run until you get a proper full-time job of your choice. Whatever skills and qualifications you possess, based on that you can make a strong profile on the top freelancing websites. Initially, this may not provide you with a dream monthly income, but you can surely keep growing with time. Check out some of the best freelancing sites in India. Did you find a new job in India? If not, stop wasting your time and start volunteering. There are plenty of NGOs in India. Working with them adds to your experience and also helps you make some money for your monthly expenditures. We all fantasize about dreamy and majestic locations in a foreign country. To get accurate information about its beauty and other real-life experiences, people generally turn to travelogues. And who could be a better travel blogger than a native of that country like you? So, what are you waiting for? Borrow some ideas with these top travel blogs and get started. Whether you’re from France, England, Spain, or Russia, every land has its own unique dance style. If you know tango, salsa, samba, or ballet, join as a dance teacher and spread your culture in India. Academic education is not the only way to get a job. Being good at sports or fitness training opens a wide range of income sources. All you need to know is how to get a job in India, or even open your own business. We know you’ve been waiting for this section, and the wait is over! Below, we’ll share the most popular ways to find a job in India. Let’s have a look at job portals in India! When it comes to finding jobs that are worthwhile, you may wish to pay attention to these online sources. You can also look specifically for foreign national jobs. These are some of the best ways to find jobs in India. The top ten online job sites in India include naukri.com, times jobs.com, monsterindia.com, indeed.com, shine.com, instahyre.com, freshersworld.com, jobsarkari.com, glassdoor.co.in, and freelancer.com. Those who are more into the conventional methods of job hunting should find the appropriate job advertisements in newspapers in India. The suggested newspapers are Employment Newspaper, The Hindu, The Times of India, and many other relevant national newspapers. Word-of-mouth and networking with the right people still stands as an effective way to hunt jobs as well. To work in India, every foreigner needs a visa. To avoid any kind of trouble or confusion at the last moment, do a thorough research and apply for an Indian visa on time. Visit the official website of India to understand every step properly. You can also find out what documents you need and the minimum time for applying before the visiting date, but keep in mind that there’s also a place to submit urgent applications. But what about the job interview in India? There are some basic questions that are asked in all job interviews, regardless of the job description or field of work. Curious what they look like in Hindi? Let’s explore a handful of them. 1- प्रश्न: आप का शुभ नाम क्या है? Q: What’s your good name? A: My name is David. 2- प्रश्न: आप कहाँ के रहने वाले हैं? A: I am from Japan. 3- प्रश्न: आप को इस कार्य-क्षेत्र में कितने सालों का अनुभव है? Q: How many years of experience do you have in this field? A: I have five years of experience in this field. 4- प्रश्न: क्या आप अगले हफ़्ते से हमारे साथ काम करना शुरू कर सकते हैं? Q: Would you be able to join us from the next week? A: Yes. I would be able to join here from the next week itself. We hope this article helped you learn about finding jobs in India, and that you’re better equipped to get your dream job there. We wish you good luck with your job search and your stay in India. 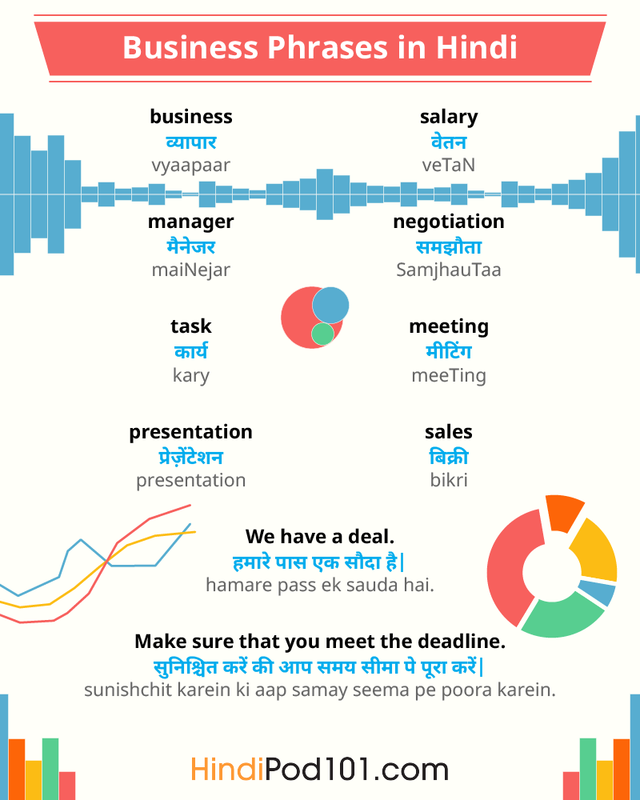 We would again like to remind you that knowing Hindi—one of the most popular languages in India—can certainly make things easier for you in your new job and in your daily life as well. Visit HindiPod101.com and get started with your first key phrases. Do you often feel lonely and sad? Do you long for romance and are willing to do whatever it takes to meet that special person? Speaking another language could revolutionize your love life! So, why wait? Learning how to say ‘love’ in Hindi could be just what you need to find it. Or perhaps you were lucky, and have found your Hindi partner already. Fantastic! Yet, a cross-cultural relationship comes with unique challenges. Learning how to speak your lover’s language will greatly improve your communication and enhance the relationship. At HindiPod101, our team will teach you all the words, quotes and phrases you need to woo your Hindi lover with excellence! Our tutors provide personal assistance, with plenty of extra material available to make Hindi dating easy for you. Will Falling in Love Help You Learn Hindi Faster? So, you have met your Hindi love interest. Congratulations! Who knows where this could take you…?! However, the two of you have just met and you’re not ready to say the Hindi word for love just yet. Great, it is better to get to know him/her first. 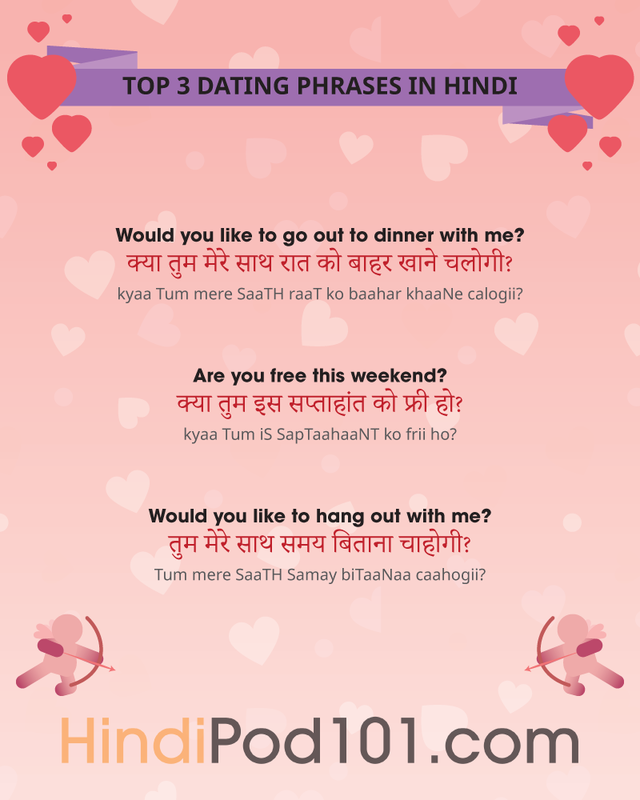 Wow your prospective love by using these Hindi date phrases to set up a spectacular first date. क्या तुम मेरे साथ रात को बाहर खाने चलोगी? kyaa Tum mere SaaTH raaT ko baahar khaaNe calogii? The important question! In most cultures, this phrase indicates: ‘I’m romantically interested in you’. Flirting in Hindi is no different, so don’t take your date to Mcdonald’s! क्या तुम इस सप्ताहांत को फ्री हो? kyaa Tum iS SapTaahaaNT ko frii ho? तुम मेरे साथ समय बिताना चाहोगी? Tum mere SaaTH Samay biTaaNaa caahogii? कल हम कितने बजे मिले? kal ham kiTNe baje milen? Tum bahuT acchii lag rahii ho. यह जगह कैसी लगती है? yah jagah kaiSii lagTii hai? This another good conversation starter. Show off your Hindi language skills! क्या मैं तुमसे फिरसे मिल सकता हूँ? kyaa main TumSe phirSe mil SakTaa huun? mujhe ek acchii jagah paTaa hai. main Tumhe gaadii mein ghar chod DeTaa huun. yah saam bahuT acchii gayii. You learned all the Hindi phrases to make a date - congratulations! Now you have to decide where to meet, which can be tricky. Discuss these options with your lover to gauge whether you like the same things. Check out romantic date ideas in Hindi below! Expressing your feelings honestly is very important in any relationship all year round. Yet, on Valentine’s Day you really want to shine. Impress your lover this Valentine’s with your excellent vocabulary, and make his/her day! We teach you, in fun, effective ways, the meanings of the words and how to pronounce them. 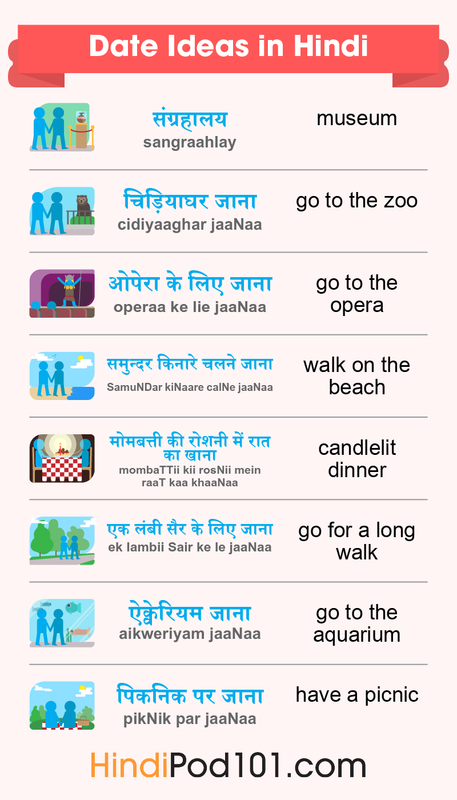 You can also copy the characters and learn how to write ‘I love you’ in Hindi - think how impressed your date will be! So, you now have the basic Valentine’s Day vocabulary under your belt. Well done! But, do you know how to say ‘I love you’ in Hindi yet? Or perhaps you are still only friends. So, do you know how to say ‘I like you’ or ‘I have a crush on you’ in Hindi? No? Don’t worry, here are all the love phrases you need to bowl over your Hindi love on this special day! mai tumhe pyaar kartii hun. Saying ‘I love you’ in Hindi carries the same weight as in all languages. Use this only if you’re sure and sincere about your feelings for your partner/friend. कया तुम मेरी वैलेनटायिन बनोगी? kya tum meri valentine bannogi? If you don’t know how to say ‘You’re pretty’ in Hindi, this is a good substitute, gentlemen! Say this if you are not yet sure that your romantic feelings are reciprocated. It is also a safe go-to if you’re unsure about the Hindi dating culture. Ladies, this phrase lets your Hindi love know how much you appreciate his looks! Don’t be shy to use it; men like compliments too. Gentlemen, don’t claim this phrase as your own! It hails from the movie ‘As Good as it Gets’, but it is sure to make your Hindi girlfriend feel very special. Let her know that she inspires you! इसे पढ़ते समय अगर आप किसी के बारे में सोच रहे थे, तो निश्चित रूप से आप प्यार में हैं. You’re a love champ! You and your Hindi lover are getting along fantastically, your dates are awesome, your Valentine’s Day together was spectacular, and you’re very much in love. Good for you! 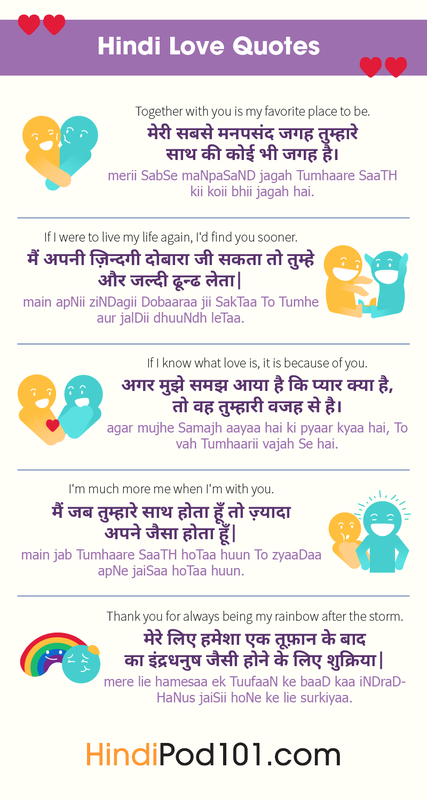 Here are some beautiful phrases of endearment in Hindi that will remind him/her who is in your thoughts all the time. Wow. Your Hindi lover is indeed the love of your life - congratulations! And may only happiness follow the two of you! In most traditions, the man asks the woman to marry; this is also the Hindi custom. Here are a few sincere and romantic lines that will help you to ask your lady-love for her hand in marriage. Yeh tum nahīn hoo. Yeh mein hoo. As long as you mean it, this can be a kind thing to say. It means that there’s nothing wrong with your Hindi lover as a person, but that you need something different from a relationship. mein iss tarah ke sambandh ke liye teyaar nahi hoon. Cali’ē sirf dōst banē rehatē hai. If the relationship was very intense, and you have sent many ‘i love u’ texts in Hindi, this would not be a good breakup line. Feelings need to calm down before you can be friends, if ever. If the relationship has not really developed yet, a friendship would be possible. Mujhē lagatā hai hhme ēk brēk kī jarūrat hai. tum iss se behtar ke layak hoo. hume doosre logo ko dekhna shuroo kar dena chaiye. Mujhe apanī jagaha kī jarūrata hai. Mujhē lagatā hai hum bhut tējī sē badd rahē hai. Mujhe apnē kariyer par dhyān kēndrit karanē kī jarūrat hai. Mein tumhārē liyē bahut acchā nahī hoo. bus ab mein tumhe or pyar nahi karta. Hum sirf ēk-dūsarē kē liyē sahī nahī hai. Yah acche ke liye hai. Hum alag hō gaye hai. 8. Will Falling in Love help you Learn Hindi faster? Most people will agree that the above statement is a no-brainer - of course it will! Your body will be flooded with feel-good hormones, which are superb motivators for anything. HindiPod101 is one of the best portals to help help make this a reality, so don’t hesitate to enroll now! 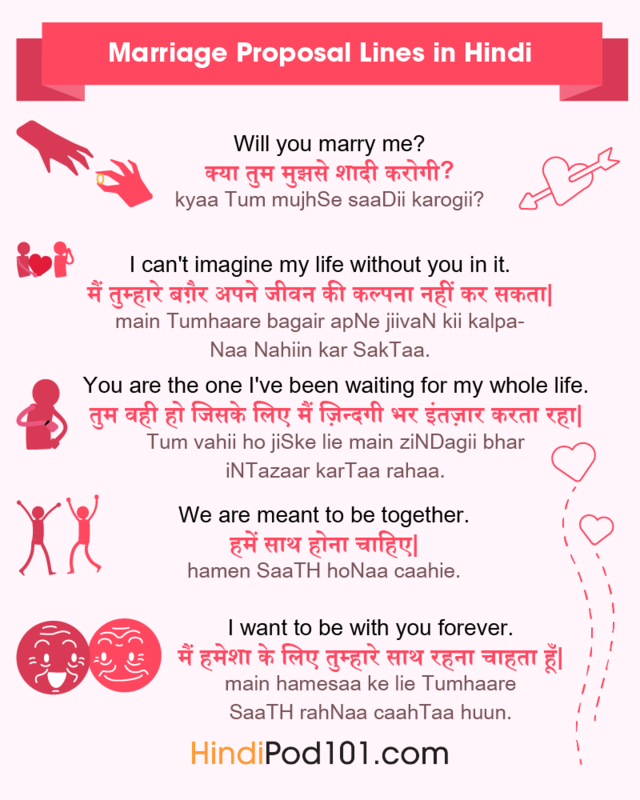 Let’s quickly look at the reasons why falling in love will speed up your learning of the Hindi language. Three Reasons Why Having a Lover will Help you Learn Hindi Faster! HindiPod101 uses immersive methods and tools to teach you Hindi, but having a relationship with a native speaker will be a very valuable addition to your learning experience! You will gain exposure to their world, realtime and vividly, which will make the language come alive even more for you. The experience is likely to expand your world-view, which should motivate you to learn Hindi even faster. Nothing beats continuous practice when learning a new language. Your partner will probably be very willing to assist you in this, as your enhanced Hindi language skills will enhance the relationship. Communication is, after all, one of the most important pillars of a good partnership. Also, you will get to impress your lover with the knowledge gained through your studies - a win/win situation! 3- A supportive Hindi lover is likely to make a gentle, patient teacher and study aid! With his/her heart filled with love and goodwill for you, your Hindi partner is likely to patiently and gently correct your mistakes when you speak. This goes not only for grammar, but also for accent and meaning. With his/her help, you could sound like a native in no time! Falling in love with a man or woman speaking Hindi is an opportunity for both of you to learn a new language! For this reason, every lesson, transcript, vocabulary list, and resource at HindiPod101 is translated into both English and Hindi. So, while your partner can help you learn Hindi faster, you can potentially also help him/her learn and master English! At HindiPod101, our focus is to help our students learn practical vocabulary and phrases used by everyday people in India. This means that, from your very first lesson, you can apply what you learn immediately! So, when your Hindi partner wants to go out to a restaurant, play Pokemon Go, or attend just about any social function, you have the vocabulary and phrases necessary to have a great time! 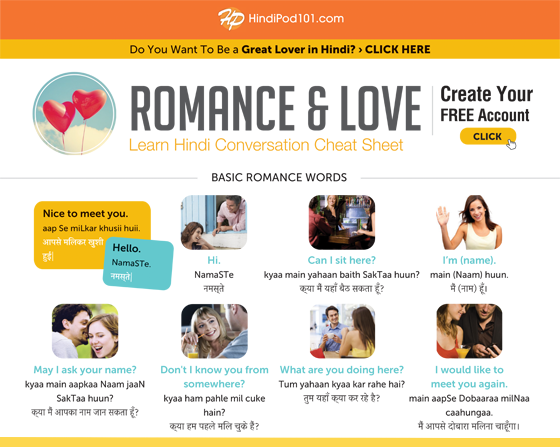 You now have access to HindiPod101’s specially-developed sections and tools to teach you love words, phrases, and cultural insights to help you find and attract your Hindi soul mate. A personal tutor will assist you to master these brilliantly - remember to invite him/her to your wedding! Vasant Panchami, or Saraswati Puja, is the Hindu celebration of the Goddess Saraswati—the Goddess of Arts and Wisdom. Celebrated each year, Hindus take seriously the importance of Vasant Panchami and the worship of the Goddess Saraswati. Vasant Panchami’s significance to the Hindus can’t be overstated. By learning about Vasant Panchami, you’re gaining wisdom and knowledge regarding the Hindu religion as well as the country of India as a whole. In this article, we at HindiPod101.com hope to answer the question, “Why is Vasant Panchami celebrated?” along with more information on Vasant Panchami. We’ll even give you some insight into Vasant Panchami in the Hindi language through our vocabulary section. 1. What is Vasant Panchami? Vasant Panchami, also commonly referred to as Saraswati Puja, is the Festival of the Goddess of Arts and Wisdom. Basant Panchami takes place at the beginning of spring. In eastern India, especially Bengal, this day marks the occasion of Saraswati Puja. Depicted holding a musical instrument called the Veena in her arms, Saraswati is the goddess of “education,” or Vidya, “music,” or Sangeet, “arts,” or Kala, and “knowledge,” or Gyan. Essentially, the Goddess Saraswati is the deity of music, dance, and every other form of learning and science. On Vasant Panchami, Hindus worship Saraswati and celebrate these gifts to mankind. 2. When is Vasant Panchami? Vasant Panchami takes place each year, though its date varies. It’s usually celebrated the last week in January or the first week in February. Learning is worshipped in this divine form in Hinduism. Homes are decorated with art and several art competitions are organised for the occasion. Religious rites are conducted in schools and homes, and Prasad, meaning “food offerings,” of spring fruits are offered to the Goddess. During this time, students pray for excellence in the arts and in learning by touching flowers to the feet of idols of the Goddess and preserving those flowers in their books for blessings. Then they visit each household and distribute blessed food. The verdant and colorful spring, along with the Puja of the Goddess Saraswati, create a festive atmosphere. The color yellow has especially great significance in the festival, and “yellow flowers of mustard,” or Sarson, are used in decorations. In Bengal, girls of all ages wear yellow sarees. It’s interesting to note that while yellow is a vitally significant color during Vasant Panchami, it’s not the only color that Hindus find deep meaning in. In fact, India is known for its colorful nature and its people are known to attach great value and various meanings to colors in general. In the northern Indian states of Jammu and Kashmir, and in Punjab, this festival is also celebrated as the festival of spring, called Basant. People wear yellow clothes and cook yellow dishes, such as saffron rice, and a kite flying competition is organized in the Ferozepur district during this time. Don’t be surprised to find music and dancing during this festival, either—this is, after all, the celebration of arts! In northern India, there’s a tradition among Sufi saints in which special floral wreaths are placed on the graves of passed saints in celebration of the Basant festival. On this day, people may also give cards to others with good Vasant Panchami wishes on them! 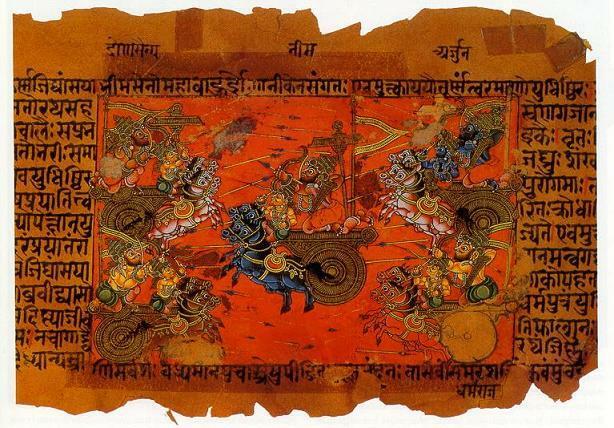 In the Hindu religion, the gods and goddesses have “vehicles” or Vahanas, on which they travel to various places (including to receive offerings and sacrifices). These vehicles are essentially spiritual animals, creatures in animal form which possess power and wisdom. It’s also thought that these magical creatures are used in wars. The vehicle used by the Goddess Saraswati is a white swan. This bird is a symbol of purity and beauty. Considering the purity, delicacy, and importance of the arts and sciences this Goddess is associated with, this should come as no surprise. 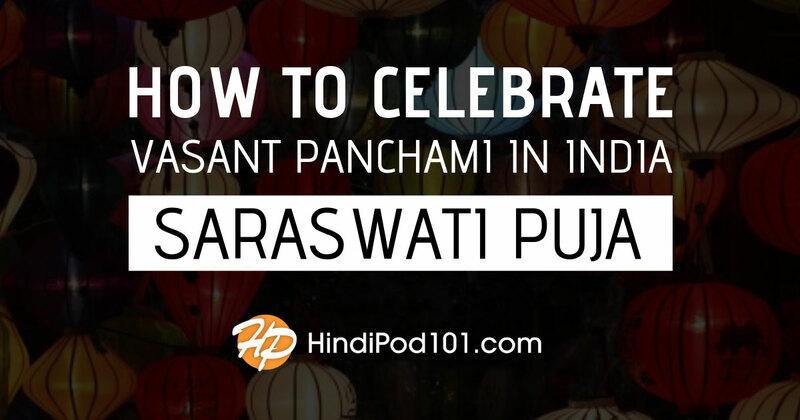 Check out this list of must-know vocabulary for Vasant Panchami so that you can celebrate this holiday to its full extent! Study this list as much as you need to, and gain more knowledge about Vasant Panchami in Hindi. 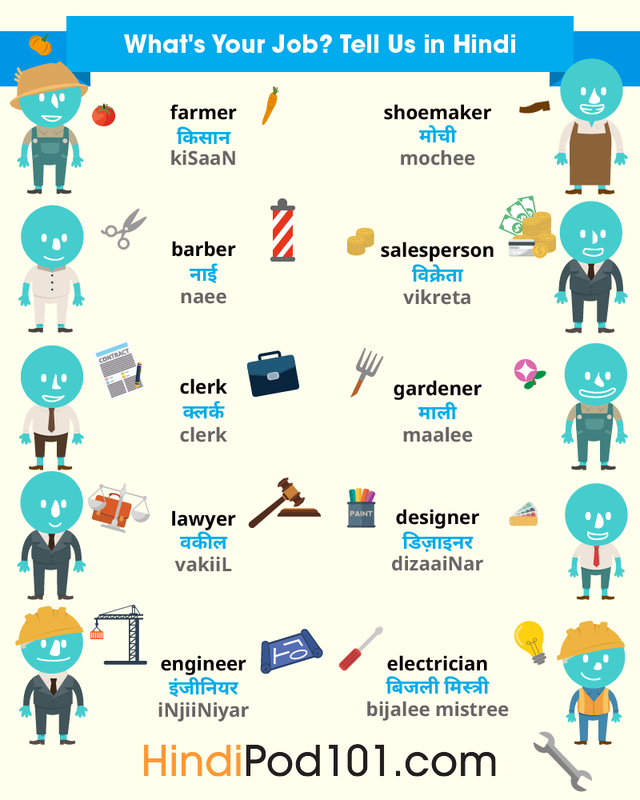 To hear each of these vocabulary words pronounced, be sure to check out our Vasant Panchami vocabulary list page. Here, you’ll find an audio alongside each word with its pronunciation. Now you know more about Vasant Panchami in India. What do you think of this holiday? Is there a holiday celebrating the arts or sciences in your own country? Let us know in the comments! To learn even more about Indian culture and the language, visit us at HindiPod101.com. We offer an array of insightful blog posts, free vocabulary lists, and an online community to chat with fellow Hindi learners about lessons. For a one-on-one learning experience, you can also download our MyTeacher app and gain your very own personal Hindi teacher! Until next time, we wish you well in your Hindi-learning endeavors. Keep up the good work and continue practicing, and you’ll be a Hindi-speaking master in no time! Can You Really Learn Hindi Alone? Don’t worry, not only is it possible to learn Hindi or any language without traditional classroom instruction: HindiPod101 has created the world’s most advanced and extensive online language learning system. Not only is HindiPod101 specifically designed to help you with learning a language on your own, it’s actually faster, more convenient, and less expensive than traditional classroom options! Let’s look at some of the benefits of learning Hindi or any language alone. In today’s fast-paced world, there just isn’t time for traditional classroom instruction. Between getting to class and studying on some professor or teacher’s schedule, traditional classroom learning is simply impossible to fit in. But when you learn Hindi alone, you can study in bed if you like and whenever suits your schedule best, making it far easier to actually reach your goal of learning and mastering the language. Speaking in front of a class, pop quizzes, and tests are just a few of the stressors you will encounter when you learn a language in a traditional classroom setting. Specifically, these are external stressors that often derail most people’s dream of learning a new language. But when you learn Hindi alone, there are no external stressors. Without the external stress and anxiety, it becomes much easier and more exciting to study Hindi and reach your very own goals—all on your own! The best way to learn a language on your own is to study from native speaking instructors. Ideally, you want audio and/or video lessons that teach vocabulary, grammar, and provide actual Hindi conversations and dialogue to help you with pronunciation. HindiPod101 has hundreds of hours of HD audio and video lessons created by real Hindi instructors and every lesson is presented by professional Hindi actors for perfect pronunciation. Plus, all lessons can be accessed 24/7 via any mobile device with Internet access. And, if you download the PDF versions of each lesson, you can even study without Internet access once the lesson is stored on your device! Although HindiPod101 has more than thousands of video and audio lessons, you need not review each and every one to learn the language. In fact, HindiPod101 has developed a feature called “Learning Paths”. You simply tell us your goals and we will identify the best courses and study plan to help you reach them in the shortest time possible. So even though you are technically learning a language on your own, our team is always here to help and make sure you reach your goals FAST! Armed with our growing collection of advanced learning tools, it’s truly a breeze to learn Hindi alone and reach your goals! Learning a language on your own is not only possible, it’s actually easier and more beneficial for you than traditional classroom instruction. In fact, when you learn Hindi on your own you can study at your own pace, eliminate stress, and actually increase cognitive function. HindiPod101 is the world’s most advanced online language learning system and a great resource to help you teach yourself a new language. With the world’s largest collection of HD audio and video lessons, more than 20 advanced learning tools, and customized “Learning Paths”, HindiPod101 makes learning a new language easier, more convenient, and less expensive than traditional classroom instruction. And the best part is: With HindiPod101, you can study in bed, your car, or wherever you have a few spare minutes of time. Create your Free Lifetime Account now and get a FREE ebook to help “kickstart” your dream of learning a language on your own below! Yes, even beginners can quickly learn conversational Hindi well enough to carry on real conversations with native speakers. Of course, beginners won’t be able to carry a conversation the same way they could in their native language. But, just knowing a few tips like which questions to ask to keep a conversation going are all you need to speak and interact with real native speakers! But before we get to specific suggestions, let’s first take a closer look at how having real Hindi conversations is so vital to your mastery of the language. 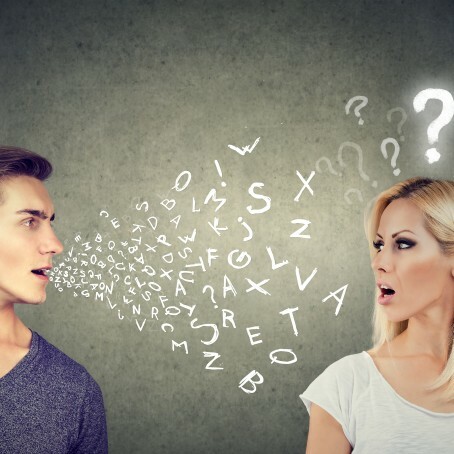 Communicating with other people is the very point of language and conversation is almost second nature in our native tongue. For beginners or anyone learning a new language, conversations aren’t easy at all and even simple Hindi greetings can be intimidating and awkward. Master the Language Faster: Nothing will help you learn to speak Hindi faster and truly master the language than having real conversations with native speakers. Conversations quickly expose you to slang, cultural expressions, and vocabulary that force you to absorb and assimilate information faster than any educational setting—and that’s a great thing! But how can you possibly have real conversations with real Hindi people if you are just starting out? For beginners and even more advanced speakers, the key is to learn to ask questions to keep a conversation going. Of course, they can’t be just random questions or else you may confuse the listener. But, by memorizing a few key questions and the appropriate time to use them, you can easily carry a conversation with minimal vocabulary or experience. And remember, the more Hindi conversations you have, the quicker you will learn and master the language! You don’t need to memorize 10,000’s of words to learn conversational Hindi. In fact, with just a couple hundred Hindi words you could have a very basic Hindi conversation. And by learning maybe 1,000-2,000 words, you could carry a conversation with a native speaker about current events, ordering in restaurants, and even getting directions. If you want to know how to carry a conversation in Hindi, then you need exposure to native speakers—and the more the better. Ideally, studying video or audio lessons is ideal because they provide contextualized learning in your native language and you can play them again and again until mastery. The Largest Collection of HD Video & Audio Lessons from Real Hindi Instructors: HindiPod101 instructors have created hundreds of video and audio lessons that you can play again and again. And the best part is: They don’t just teach you Hindi vocabulary and grammar, they are designed to help you learn to speak Hindi and teach you practical everyday topics like shopping, ordering, etc! 2000 Common Hindi Words: Also known as our Core List, these 2,000 words are all you need to learn to speak fluently and carry a conversation with a native speaker! Although it may seem intimidating for a beginner, the truth is that it is very easy to learn conversational Hindi. By learning a few core vocabulary terms and which questions to ask to keep a conversation going, just a little practice and exposure to real Hindi conversations or lessons is all it really takes. HindiPod101 has created the world’s largest online collection of video and audio lessons by real instructors plus loads of advanced tools to help you learn to speak Hindi and carry a conversation quickly. Of all the Indian holidays, the India Republic Day holiday may just be the most significant. This is a national holiday in India, and is a day for great celebration over the adoption of its new constitution in 1950—making it a republic at last! Find out all about India Republic Day with HindiPod101.com, from the India Republic Day parade to this Hindu holiday’s origins. 1. What is Republic Day in India? In India, गणतंत्र-दिवस (ganTaNTra-DivaS) or “Republic Day” is the celebration of January 26, 1950 when its constitution (or Samvidhaan) was implemented at last. This allowed India to officially become a republic (or gantantra) at last. Prior to this, up until 1947, much of India was under British rule. While India technically gained its independence in 1947, it wasn’t until the constitution was adopted that it actually became a republic. At the time, it was a state with fifteen official languages, twenty-six accepted languages, and a conglomeration of five religious communities and myriad cultural communities. The celebration of Republic Day is also a celebration of India’s huge cultural diversity. India celebrates its Republic Day each year on January 26. As far as India holidays and celebrations go, Republic Day is one of the most significant. The celebrations begin each year with the President saluting the Amar Jawan Jyoti, meaning “The flame of the immortal soldier,” which is below the ramparts of the India Gate located in the capital. Amar Jawan Jyoti, as its name indicates, is an eternal flame burning in memory of the soldiers who gave all in order to help establish a sovereign India. The President salutes these sacrifices, and then awards those people who have made outstanding contributions in their respective fields of work. The Bharat Ratna award is the nation’s highest civilian honor. This is followed by a festive parade on New Delhi’s famous Raj Path, which means “Royal Road.” The first showcase of the parade is a magnificent display by the regiments of the Indian army, navy, and air force. This is followed by tableaus of all the states of the union. Each tableau offers a display of the state’s wealth of people, music, culture, dance, and dress as it proceeds down the parade route. Thousands of people gather at the Royal Road to witness this ornate display, also called the India Republic Day parade, while millions of others catch it on television in Hindi. Sometimes, there are also India Republic Day guests. For example, U.S. President Barack Obama visited India for Republic Day in 2015 as an honored guest. India’s Constitution is longer than that of any other state in the world. It has 448 articles and 118 amendments. The constitution declares India to be an independent, democratic, secular, and socialist republic. Today, this new constitution is still seen as the strongest word of law in India; even the Indian Parliament is unable to supercede it. If you want to hear each word pronounced, be sure to check out our Republic Day vocabulary list, which includes an audio with each word. Now that you’ve learned about India’s Republic Day, you’ve gained another layer of knowledge regarding India’s culture and its people. What do you think of this important national holiday? Is there a similar holiday in your country? To learn even more about India and its culture, be sure to visit us at HindiPod101.com! Alongside insightful blog posts and a variety of vocabulary lists, we also host an online community so that you can discuss your lessons with fellow students. And if you prefer a one-on-one learning approach, you can even download our MyTeacher app. We wish you success in learning Hindi and discovering the depth of India’s history. You’ll be speaking Hindi like a native before you know it! Today, classrooms are no longer the only or even best place to learn a new language like Hindi. More and more people are finding that they can easily learn a language just about anywhere they have a few minutes of spare time, including their daily commute to work. According to the U.S. Census Bureau, the average American spends over 50 minutes a day commuting to and from work, or over 300 hours a year. But rather than simply sitting in traffic and wasting the time, you can instead use your daily commute to literally learn Hindi in just a few short months! HindiPod101 has developed specialized learning tools that you can use on your commute to work (and home again) to master the language in your spare time. Keep reading to learn how to get your free audiobook to use on your next commute so you can see for yourself how easy it is to transform “dead time” into realizing your dream of learning a new language! Not sure if it’s practical to learn another language while commuting to and from work each day? Well not only is it possible—learning in your car on the way to and from work each day can actually help you learn and master Hindi or any language much faster! The simple truth is that repetition is absolutely vital to truly internalizing and mastering any language. So, if you listen to audiobooks or even audio lessons on your commute to work and then repeat the same lesson on your commute home, the information is more likely to be “locked-in” to your long-term memory! 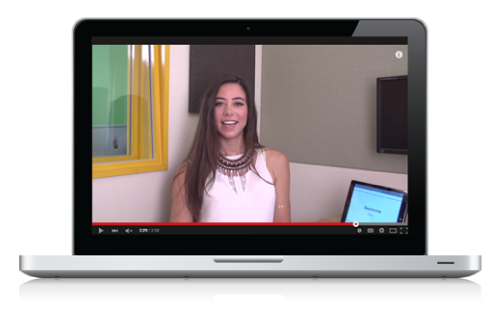 Every single week, HindiPod101 creates new audio lessons by native speaking instructors. All lessons are short, to the point, and guaranteed to improve your mastery of Hindi. Simply exposing yourself to new information and vocabulary terms helps increase your fluency and mastery of Hindi. So every single day, HindiPod101 adds a new Word of the Day for you to learn and memorize during your commute. Have a short commute to work but still want to make progress towards learning and mastering Hindi? Not a problem! Our Daily Dose Mini-Lessons are 1-minute or less and designed to improve your grammar, vocabulary, and pronunciation. You don’t need a PC or tablet to learn Hindi during your daily commute. At HindiPod101, all of our lessons, tools, and resources are available 24/7 via our Mobile App. That means you can access all of our audio lessons and other tools during your commute to work or any time you have a few spare moments! In addition to the world’s largest online collection of HD audio lessons, HindiPod101 has also created several audiobooks to enhance your understanding and make it more convenient than ever to learn a language during your commute! The average commute time of most Americans is over 300 hours each year and it’s the perfect opportunity to learn and master a new language. In fact, you can use the “dead time” during your daily commute to learn a new language and potentially boost your lifetime earnings by up to $70,000 or more! Whatever your motivation, HindiPod101 has the tools and resources necessary to help you learn a new language each year during your commute to and from work. Act now and we’ll even provide you with a free audiobook to try out on your next commute! So, you’re heading for India to travel or work. Awesome! You’re in for an amazing adventure! It’s a beautiful country, steeped in a rich culture that may be very unlike your own. However, showing respect to the locals is a big deal in every country around the world. A respectful manner and attitude could open doors for you that would otherwise remain mystifyingly closed. 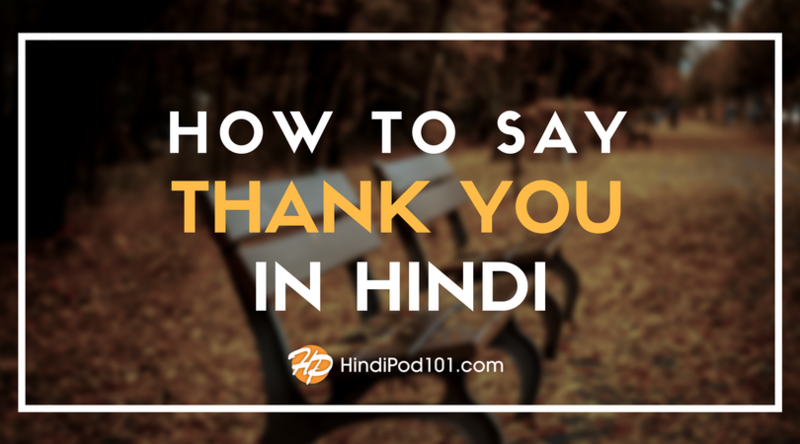 Aside from just knowing ‘Thank you’ in Hindi, greeting someone correctly in Hindi could incline a local to treat you more favorably than otherwise! So, the clever thing to do would be to learn Hindi greetings before you embark on your journey. Hindi greetings are different from other languages and probably not what you’d expect. 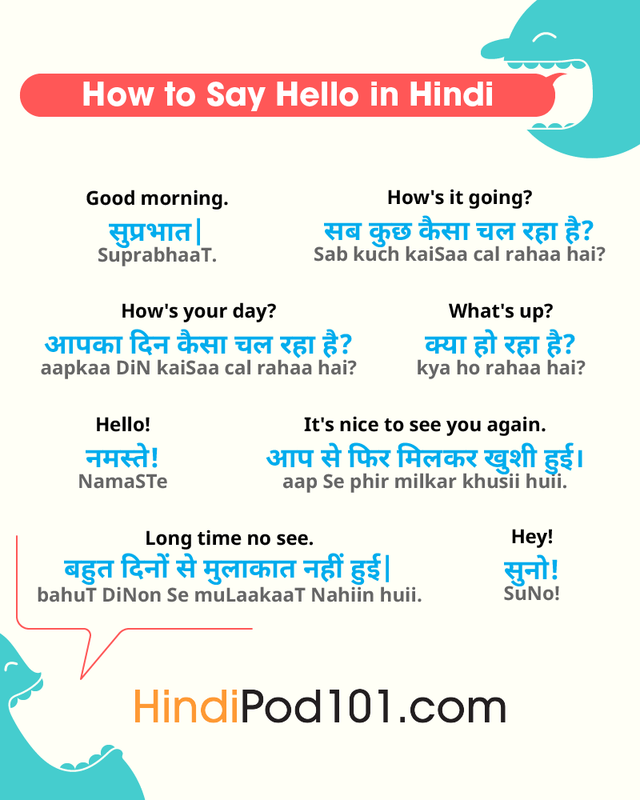 But if learning how to say ‘Hello!’ in Hindi in easy and fun ways is important to you, you’ve come to the right place at HindiPod101. This short, but powerful lesson teaches you the basic ways to greet someone correctly in Hindi! At HindiPod101, you will be taught the correct pronunciation and intonation, as well as the correct times to greet in Hindi. And you will have fun! The word namasTe is so closely associated with India and Indian culture that it has become famous all over the world. We use namasTe as a formal, as well as a friendly, greeting. It’s used when people meet at any time of the day—morning, noon, or evening! A variation on namaste, which you may or may not have heard before is namaskar. In Hindi, using different greetings for each time of the day is not very common. When talking with friends, we usually just use the English phrases. But there are equivalent Hindi versions—they’re just not used that often. People sometimes use the Urdu word Alvida which means “Good-bye.” It is an appropriate choice when parting for a long time or forever. Standing at the airport in a foreign country for the first time can be a somewhat scary experience for anyone, especially if you need assistance. However, don’t worry - at HindiPod101 we teach you how to quickly get a local’s attention with friendly, correct Hindi greetings! You are more likely to get helped this way. Here is our Hindi greetings list of all the general ways to address a person upon meeting. It is tailored for formal and informal situations. ‘Good morning’ in Hindi is acceptable any time between approximately 5:30am and 12:00pm, when the day is still young. And smile - it’s the universal ice-breaker! bahuT DiNon Se muLaakaaT Nahiin huii. ‘Good afternoon’ in Hindi is an informal greeting and is used during the second part of the day. The appropriate period falls, in most cultures, from 12:00am till sunset. सब कुछ कैसा चल रहा है? Sab kuch kaiSaa cal rahaa hai? aap Se phir milkar khusii huii. This friendly, welcoming phrase is best used after greeting someone you have not seen for a while. If you mean it, you will make the person feel special! This is a good thing to say to make someone feel welcome in Hindi. सब कैसा चल रहा है? Sab kaiSaa cal rahaa hai? आपका दिन कैैसा चल रहा है? aapkaa DiN kaiSaa cal rahaa hai? Ask this when you’re speaking to your Hindi friend during the day. It’s a friendly phrase to start a conversation with. Suitable for use in most settings, situations and persons, this is an important Hindi greeting to know. Be sure to master this word first at HindiPod101! 3. 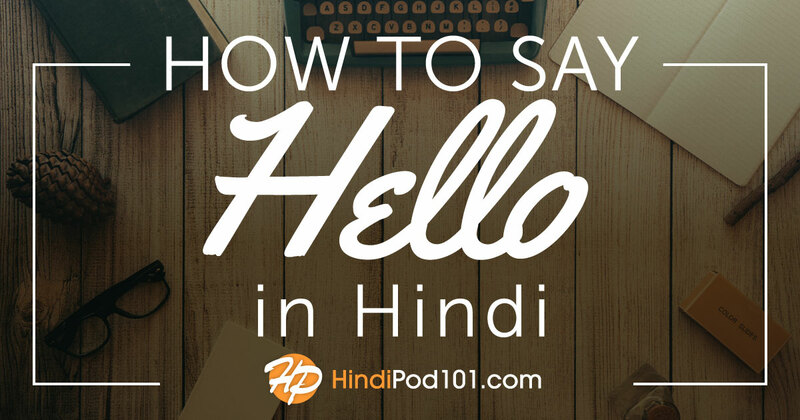 Why Should You Choose HindiPod101 To Learn How To Greet In Hindi? Friendly native Hindi speakers guide you step-by-step through the process of learning vocabulary, phrases and much more. They demonstrate correct pronunciation and emphasis of the words, so as to ensure that you speak like a native when you’re done! Watching the enthusiastic tutors makes not only for a pleasant and more personal experience - it also allows you to copy mouth and lip movements. It’s like learning from your own Hindi friend in your own home! PC, Android, iPhone, iPad, laptop, even TV - whatever device you prefer! Go online with our FREE app to do your lessons, no matter where you are or which device you are using. All you need is a good internet connection to log on and learn to speak Hindi at your own pace, in your own place! 3- Pronunciation Tool Ensures You Really Speak Hindi! In any language, correct pronunciation is often crucial. The nuances in language require this, or you could find yourself saying things you don’t mean. You will find our Pronunciation Tool invaluable to wrap your mouth around the correct way to greet in Hindi! Every week, new audio and video lessons are uploaded, so as to keep our promise that learning Hindi with HindiPod101 is always fun and exciting! In addition, you will get access to bonus material and basic Hindi phrases. These are a fantastic way to build your comprehension and speaking skills! Most learning activities are more fun when you’re not doing them alone. For this reason we developed Premium PLUS, which gives you a personal tutor - 24/7! Also, this way you’re likely to learn to speak Hindi much faster! So, if our lively Hindi blog is not enough for you, just upgrade to Premium PLUS to get your very own teacher. Personalised goals and lessons based on your needs, assessment of your progress, non-stop feedback and many other super features makes this a very attractive option. Say ‘Hello’ to a wonderful, exciting way to learn another language, and learn how to say ‘Hello’ in Hindi in no time! You will be very happy you did! Most people don’t like to hear this, but consistent hard work is one of the biggest factors in your language learning success. The course or method you choose makes a difference too, but at the end of the day you ride or die by the work you put in. However the quantity of time spent studying Hindi, doesn’t necessarily determine the quality of your of study. Spending three hours a day watching bollywood movies doesn’t help you learn much if you’re not actively engaging with the language. 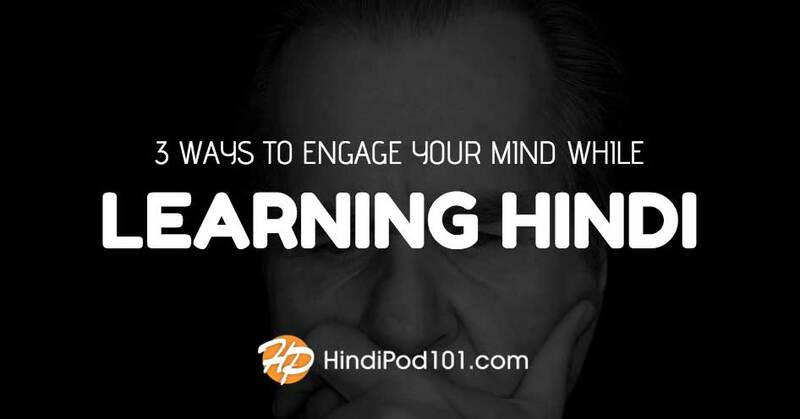 In this article we’ll talk about how to actively engage your mind while studying Hindi. You’re probably familiar with the phrase “feel the burn”, or maybe “no pain no gain”. If you’ve been to your local gym recently, there’s a chance you might have heard one of these phrases, or seen them plastered on a wall. There’s an idea in the world of sports and workouts, that the discomfort you feel when running, pumping iron, or doing some other physical activity, is what brings results. I remember taking a college health and fitness class, where we discussed how during a healthy workout the muscles of the body are affected at a microscopic level. The discomfort you feel is your muscles being pushed to their limit. It’s the limit pushing that strengthens your muscles so that over time your performance increases. In the context of language learning it’s helpful to think of your brain as a muscle (though in actuality it isn’t one). Just as we need to push against our physical limits when exercising, we also need to push our mental ones when learning a foreign language. Have you ever studied or practiced your Hindi in a way that left you tired or even exhausted? If so, you’ve experienced what it’s like to push your brain out of its linguistic comfort zone. One of the easiest ways to push your Hindi skills is to practice active listening. Active listening is when you listen to spoken Hindi and do your best to understand what you hear. The best way to accomplish this is by using audio that your can’t completely understand on the first listen. Preferably you want to use audio that has subtitles or transcripts in Hindi for you to double check your understanding after you listen to it. You can use movies, youtube clips, or HindiPod101 (which by the way has very useful transcripts for each lesson). During this exercise I like to imagine I’m listening in on a phone call with bad reception, and I’m only able to pickout a few words here and there (the ones I can easily understand). During a practice session you should listen to the audio several times. The first time around it’s okay if little to no words stick out to you. Simply make a mental note of any words or sounds you recognize. The second time you listen you’re likely to recognize a little more than you did the previous time. Expect similar results with your third or even fourth time listening. After you’ve hit the ceiling of words you can decipher, go ahead and look at the Hindi subtitles or transcripts. Listen to the audio again will reading along with the text. Odds are that you will see words in the text you know but didn’t hear correctly. You’re also likely to encounter words that are new to you completely. As you play back the audio and read along, try to guess what these words mean from the context of the words around them. After you’ve read along a couple times feel free to look up the unfamiliar words in a dictionary or translator app. This active listening exercise routine is a great way to increase your listening and comprehension skills, while picking up some new vocabulary along the way. It also allows you to learn new words in context, which itself is a powerful way to help you retain what you study. Practicing Hindi with native speakers is the epitome of pushing your language skills. Using what Hindi you know to communicate in real time is where the rubber really meets the road. Try to connect with a native speaker on a weekly basis. Regularity is what makes the difference when you’re learning a foreign language. If you live in a large metropolitan area, then there’s a significant chance that there are some local Hindi speakers nearby. Try hitting up a local language exchange or meetup group to make the necessary connections. If you’re unable to find a practice partner locally then you can take your search to the world wide web. There are a number of sites out there that help you find and connect with other language learners from around the world. If you’re a native English speaking learning Hindi it may be difficult to find a native Hindi speaker who is learning English (many Hindi speakers also have a high level of English). If you know a second language like French or Spanish, you may be able to find someone who knows Hindi and would like help practicing one of these languages. If you don’t already speak another language besides English or Hindi, don’t worry. There are tons of language learners around the world who have learned or are learning Hindi as a second language. You’re likely to find someone who knows Hindi and is looking to improve his or her English (though they might not be a native speaker). Learning Hindi isn’t always easy, but it’s the discomfort that comes with pushing your ability in the language that produces results in your studies. Don’t be afraid to step outside of your Hindi comfort zone. The further away you get from your native language, the closer you’ll be to attaining fluency. Also remember that language learning is in every way, a lot like an adventure. There will be fun times, and times when it feels like you’re swimming up the proverbial stream. It’s by keeping your head up long enough through these ups and downs, that you will experience the priceless satisfaction that comes with learning a foreign language. Keep on trucking!